Demonstrating an imaginative use of materials and colours, this is an ideal snare for those looking for a subtle partner to brushes and light sticks. Great build quality. Looks brilliant. Lots of warm, graceful tones. The man behind AD Drums, and this wooden snare, Carl Haffield, began "dabbling" in drums at the tender age of 14, having been asked to shorten the depths of a complete high-end kit for a mate! "The AD Drums range makes a pick'n'mix counter appear dull in comparison"
Fortunately, instead of an act of drum brutality, the 'conversion' was a complete success, retaining the friendship and sowing the seeds of the potential for a business in drum construction and customisation. However, it wasn't until 2007 that Carl (who has recently just turned 27), established AD Drums. Since then he has amassed a lavish back-catalogue of bespoke snares and complete kits in a huge range of colours, materials (hybrid, acrylic, wood, metal, etc), drum metal work components - a drum assortment that makes a pick'n'mix counter appear dull in comparison. 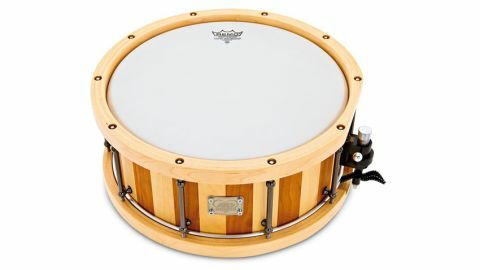 With its maple ply counter hoops and recessed tuning bolts, this cherry/birch snare is quite striking - it is extremely difficult to stop touching the drum, it is a beautiful object! The shell is constructed from alternate vertical staves of solid cherry and birch, pieced together with precise tongue and groove jointing. The bearing edges are cut dead-centre of the 12mm-deep stave and spaced to coincide with every other section of the 10 chromed tube lugs. The final touch comes from the excellent GS007 trick throw-off - a well-engineered and commendable inclusion on such a snare. After a quick check and smooth adjustment of the head tensions, the cherry/birch combo is awarded with a few strikes. Cross-sticking over the maple rim gives a deep woody clonk and a pleasant warm snare 'thwock' when struck dead-centre. This is a drum which comes with built-in finesse and grace and demands respectful brush work or delicate ghost notes when played with a pair of light sticks.